Netflix’s Daredevil has cast another key role – Matt Murdock’s best friend ever since they met on the first day of college: Foggy Nelson. 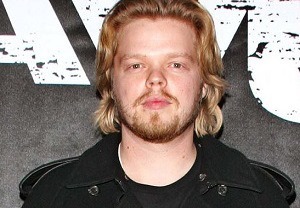 Nelson will be played by Elden Henson, who will be featured in the upcoming The Hunger Games: Mockingjay Part 1. Foggy and Matt are partners in the Nelson & Murdock law firm and Foggy’s fierce commitment to the community rivals Matt’s own. Henson joins a cast that includes Charlie cox, Vincent D’Onofrio and Rosario Dawson. For more details, follow the jump. Marvel casts fan-favorite character in new series for Netflix! With a diverse body of acclaimed work, including the “Hunger Games” and “Mighty Ducks” franchises, Elden Henson will play Foggy Nelson, Matt Murdock’s best friend and legal partner. In a town full of crime and corruption, Foggy’s friendship to the community and passion for improving it have made him a friend to its many residents from all walks of life. “Elden plays one of the most important characters in the world of ‘Marvel’s Daredevil,’ and we’re thrilled to see Foggy Nelson brought to life by such an incredibly talented actor,” said Jeph Loeb, Marvel’s Head of Television. “He perfectly captures the heart and soul of this series, bringing an added resonance to Matt Murdock’s fight against the injustice in their great city. "Marvel’s Daredevil" follows the journey of Matt Murdock, who was blinded as a young boy but imbued with extraordinary senses, now fighting against injustice by day as a lawyer, and by night as the super hero Daredevil in modern day Hell’s Kitchen, New York City. Marvel’s first original series on Netflix is Executive Produced by series Showrunner Steven S. DeKnight (“Spartacus”, “Buffy: The Vampire Slayer”, “Angel”) and Drew Goddard ("Cabin in the Woods," "Lost," "Buffy The Vampire Slayer", in addition to writing the first two episodes of Daredevil), along with Marvel TV’s Jeph Loeb (“Marvel’s Agents of S.H.I.E.L.D.,” “Smallville,” “Heroes”). For more information on "Marvel’s Daredevil," and the other exciting new Marvel Television series coming to Netflix, stay tuned to Marvel.com.